If you’ve not yet witnessed the magic known as Flour Box Bakery, then today you’re in for a treat. 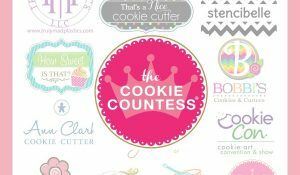 In addition to running a successful bakery, my friend, Anne Yorks, teaches others the art of cookie decorating through online videos and classes, runs an online supply shop, and after all that, still makes time to root for her team! 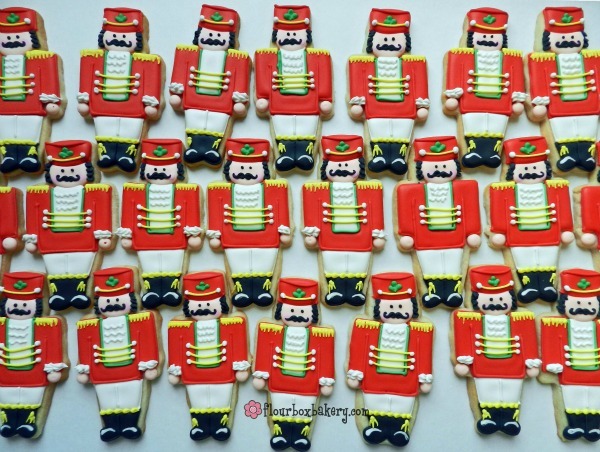 Follow along as she breaks down her amazing amazing Christmas nutcracker cookies, in true Flour Box style! Hi! My name is Anne Yorks and I’m the owner of Flour Box Bakery! 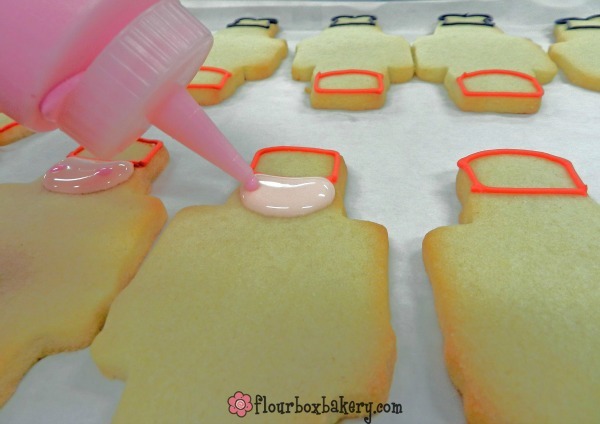 Not only, does Flour Box Bakery specialize in hand-iced sugar cookies, but we also sell the most popular decorating supplies in our online shop, offer dozens and dozens of fun cookie videos on our YouTube channel, and have an online Craftsy class all about cookie decorating! To say I’m a little crazy over cookies is an understatement. But…it’s the thick of cookie season right now and flour and sugar are quite literally flying everywhere. It’s easy for the joy of decorating to get lost in the shuffle. Are you feeling this way too? 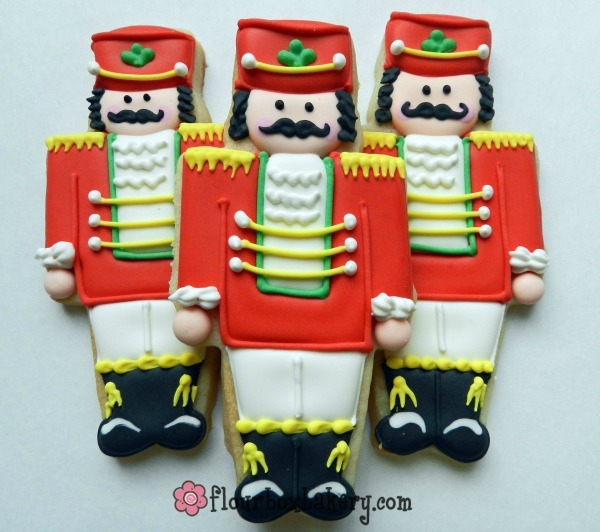 Thankfully, this cute little nutcracker guy has come along and saved my holiday cookie spirit. He is full of fun details, and thankfully, pretty easy to do when you take him step-by-step! So if you’re up to your ears in holiday stress, take a moment to draw in a deep breath and exhale and enjoy a little cookie video magic! I love this design because I did not need an expensive projector to successfully complete it. I like to decorate directly on my cookie sheet as much as possible. 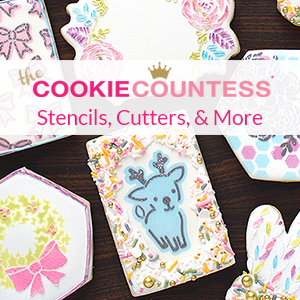 Just by using the shape of the cutter and outlining in a specific order helped me to get a consistent design from cookie to cookie. I like to work in assembly line fashion, especially since I was making 3 dozen of these. First, I outline the hat and boots. I chose to leave the boot as one section to avoid small icing areas. I will add an accent line to separate the boots in the end. Notice the red outline on the hat stops at the curve of the head. 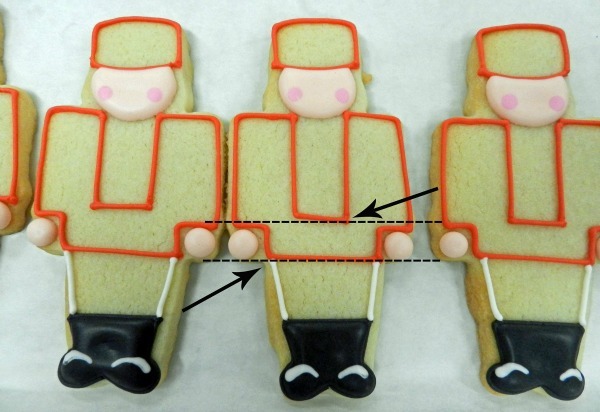 Looking for those transition points on the cookie really helps to keep the outline consistent. I liked keeping the cookies lined up next to each other so I can see the height of the boot…trying to keep them as similar as I could. Then using the 20-second skin color, I flood the face, adding two dots of pink for the rosy cheeks. I do this before outline the jacket to keep a nice round shape to the face. The boots are flooded black and I add a white wet-on-wet highlight to the boot top. 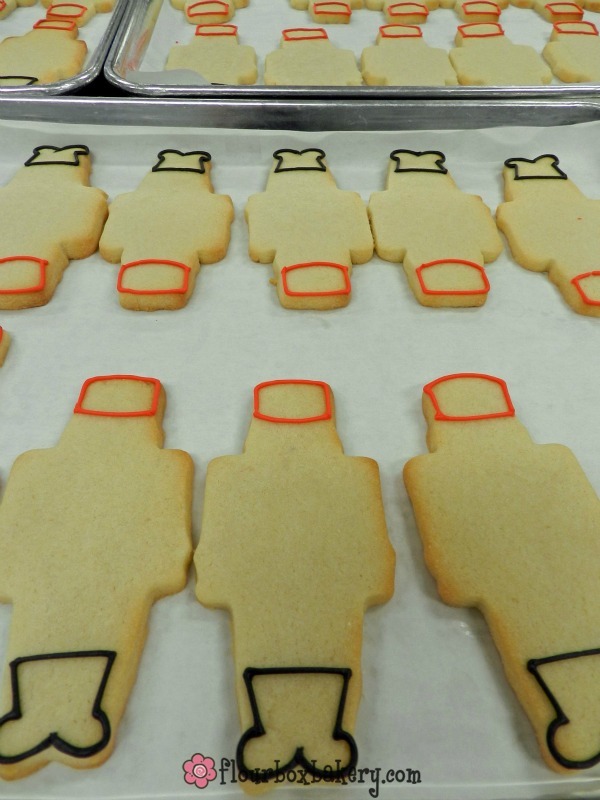 It helps to bring the cookie design to life! And that little detail is super quick and easy to add. I let these sections dry in front of a fan before moving on. Pay attention to this part, because I believe this is the most important part to successfully outline this cookie. I added the simple round hands. Then, I use the shape of the cookie to get the red jacket outlined all in one fluid motion (re-watch the video if it helps). Starting at the head, I work down around the shoulder, around and down from the hand…this is also where the cookie transitions to the pants line. I added dotted lines to the photo to emphasize these transition points that can be used to guide your outline. Then up around the second hand and shoulder. I continue my outline to mark off the center white area. I stop just at the cuff line, and over and back up to close off the space. After doing this 2 or 3 times, you’ll really find your rhythm! Add two white lines to finish off the pants. I flood the white areas and allow them to dry in front of a fan for an hour or more. Then I fill in the rest of the cookie with the red flood. I like Americolor Super Red. I make it the day before I decorate and it really brightens with time! Now for the fun part…the details!!! Add black hair with tip #65s (you could use a #2 for this, but I really like the texture from this mini leaf tip) We carry this tip and others in our online shop here! Add green details with piping icing and tip #2. Three teardrops create the fleur de lis on the hat and a simple green outline around the white area. The yellow icing really brightens the design. Add a swag line to the hat and three across the chest. A line with teardrops to create the shoulder tassels. Then a bead board and tassel on the boots. Add white dots to the swag lines and an accent line on the pants to define that area. I also add some quick white scalloped lines on the white for the ruffle on the chest. Switch tip to #13 (star tip) to add the cuff. Again, you could use a #2, but the #13 adds a fun texture to the design. Finally, add the black eyes and mustache and an accent line on the boot. 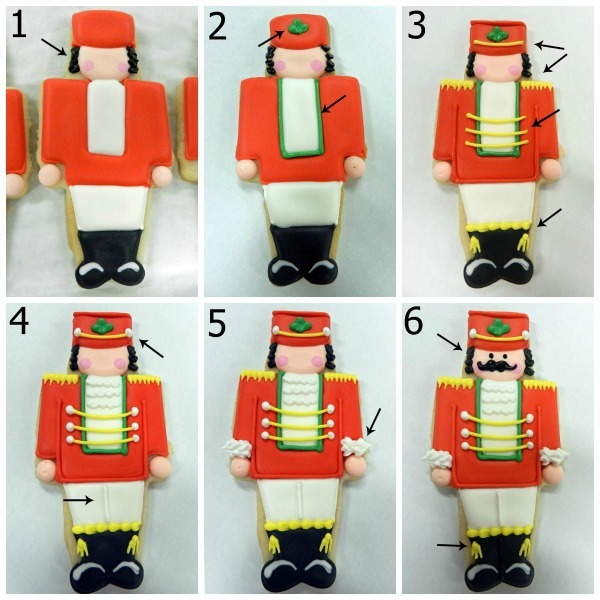 I do all these steps in an assembly line…meaning, I add all the hair to all the cookies, then all the green…and so on. I find the less I’m picking up and putting down my icing bags, the more time I save. 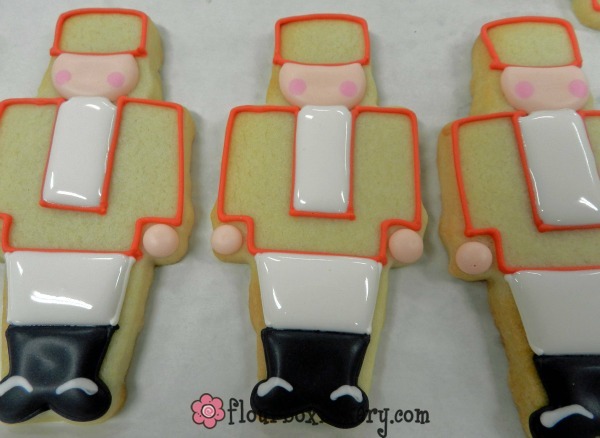 I hope you enjoyed this cute and sweet nutcracker! 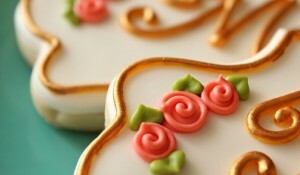 For more cookie tips, tutorials and cookie fun, check me out at Flourboxbakery.com! Wishing you a Sweet and Merry Christmas!! Great tutorial post! Loved the video! Love the nutcrackers! Thanks for the tutorial! Cost Audit Auditing Homework Help, Online Auditing Assignment & Project Help DEFINITION Cost audit has been defined as “the verification of cost accounts and a check on adherence to the cost accounting plan. 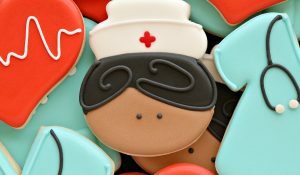 I like to eat cookies and i love to bake cookies.. i have never ate before these type of cookies.. 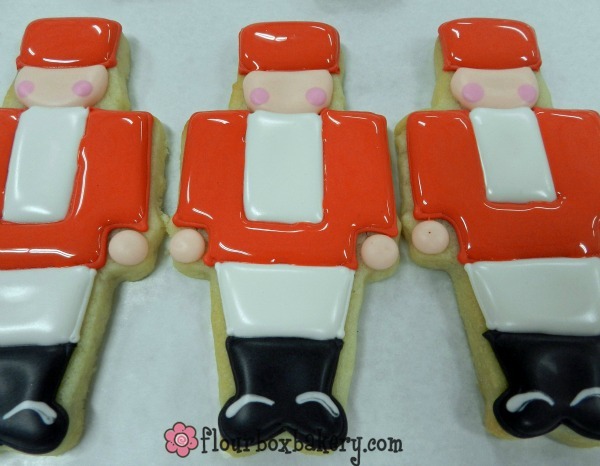 I want to try this recipe of Christmas Nutcracker Cookies.It looks cute.. Extraordinary Post !! Extremely intriguing theme will bookmark your for visit again..nice post……. I was a driving understudy for quite a bit of my instruction furthermore exhorted an understudy bunch for workers, so ideally I can offer a few recommendations. I enjoy the little cookie video magic. It is really interesting. I love this memorable treat with cookies. I am thankful to you for giving this wonderful treat. I would like to share this great experience through dissertation writing service UK. Thank you for giving such a wonderful tips. We provide the top quality assignment help online for the students that they get good marks in their academic. different types of computer science assignment and projects are solved by NAH experts including programming assignment, simulation , operating system and micro-controllers. Good job Annie York. I would like to appreciate your work. Really fantastic one. Your spirit and confidence bring you this success. Thanks for sharing this. All the best for your future. Our website is No. 1 in Project Management online Assistance Help. You can also hire us for PM Homework and Assignment Help. I also like the diversity of the remarks way as well. Waiting for that following publish. I love these cookies and these are great. internet with the help os playstation gafas de sol ray ban baratas codes generator. This Cutcracker seems to be really nice. I want to give it a try. Can I purchase this Cutcraker in Canada. What a wonderful recipe you have here! Will definitely try it this NY eve. Thanks for sharing. thanks for sharing, these amazing fitness tips if you are looking for some fitness gears then you must check it out here. AromaSuperStore Cheap Aromatherapy online. 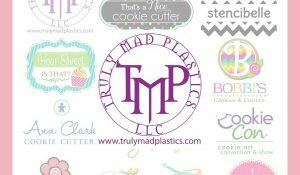 We have a large selection of products to choose from. When you sell an investment at a profit, you will owe capital gains taxes on the money you make. 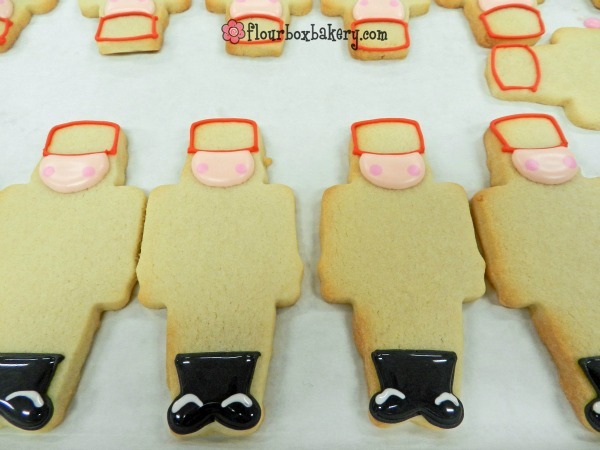 I want to prepare this cookies for Christmas.